Ruth Nettleton’s ‘Ossett Town Hall 1908-2008’, is an illustrated history of the fine Edwardian building which dominates the Market Place. 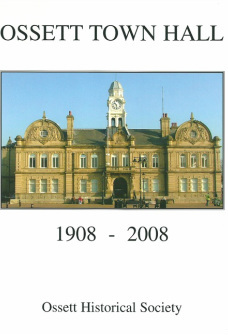 The first attempt to provide Ossett with a Town Hall was made in 1856 but it was not until the town became a borough in 1890, when the first Town Council and Mayor were elected that the campaign really took off. The many images of people, events and celebrations reflect the life of Ossett over the last 100 years. Copies are available from the Secretary for £5 plus postage and packing.